Obios however has raised this particular vice to artform and has experimented beyond that to most any form of alcohol. 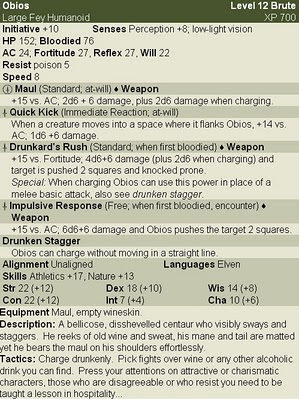 He is known to, and avoided by other centaur ravagers as he's an unreasonable drunk. Seldom seen awake during the morning, Obios has over time sunk into minor banditry, strongarm work and unpleasantness and seems to be content with where he is. He's quite amiable if you give him what he wants. The problem is, faced with a drunken centaur armed with red eyes, sour breath and a body odour that combines the worst of horse and sot, most rational people shy away. Obios senses this and is offended that he is being judged (unfairly) because he's a centaur. This has caused more fights than a few, foes learn you don't blindside him and to watch outl. Given his attraction to charismatic and beautiful people, he will often find himself getting into trouble with militias or guards over misunderstandings related to drink and has more than once been beguiled by a pretty face into doing things which have made him want to drink so he can forget what's happened... this tactic works for him but not for anyone else.